Getting on Google Maps is crucial for online exposure. Businesses that don’t show up on the service miss out on millions of users who use it every day to find a new place to spend their money. 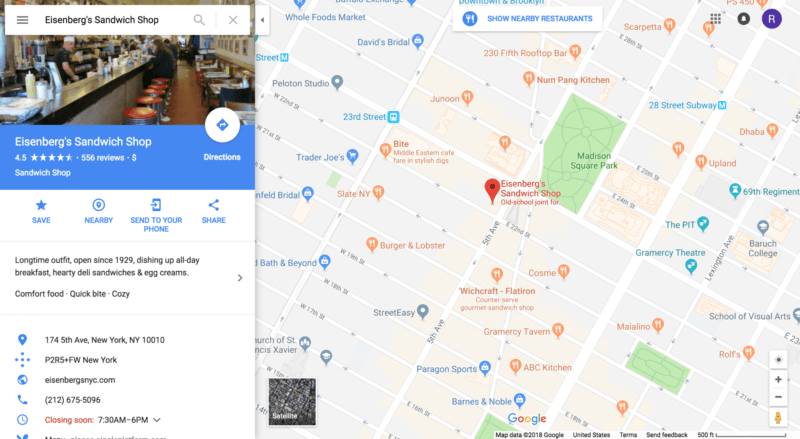 Google Maps businesses should also include crucial information – such as hours, offerings, and photos – to give customers enough information to make a decision. On top of showing you how to create your a Google Maps business listing, we’ll also provide some crucial information about the way Google determines local ranking. Getting on Google as a business requires a Google My Business account. Those with an account will need to sign in to the service. If you don’t have an account you can get one by reading our handy guide. To have a listing show up on Google’s products, such as its search engine and Maps, it needs to first pass Google’s verification program. The verification process can take anywhere from a few minutes to two weeks depending on the verification methods available. Businesses with one to nine locations will need to verify each location individually. However, those with 10 or more locations can go through a bulk verification process. You can learn more about the many verification options for businesses in our detailed guide. Google says it gathers data from three main factors to determine a business’ local ranking: Relevance, Distance, and Prominence. These factors, when used together, will help users find the best matches for their queries. However, businesses can improve their ranking by adding or updating information within the three factors. This determines how well a listing matches a user’s search query. To find the best match, Google will read multiple pieces of information. To help Google better understand a business, GMB users will need to add as much information as possible for each listing. A business name, phone number, and address might not be enough. Additional information, such as amenities, hours of operation, and detailed descriptions can all contribute to a better match. This one is difficult to control because it relies on a user’s location to find nearby matches. If a business just so happens to be inside that search radius along with a competitor, it can use additional methods to stand out. On top of more detailed and accurate information for relevance, GMB users should also add photos because of their importance in local search. Research shows that people value a business profile photo (24 percent) as the top deciding factor when it comes to local search. An appealing set of images can help attract customers. More importantly, satisfied customers will want to tell others about their experience, which can raise a business’ local prominence. This one is all about reputation. Obviously, well-known establishments and famous locations rank higher in this category, but there’s a way for any business to climb the search results ladder. The way that Google determines prominence is through a digital footprint. This can include things like external or internal links, articles from other sites, or even citations. Citations are extremely important because it shows that a business is exposing itself to as many customers as possible on multiple sites. However, citation information needs to be accurate and identical across multiple listing websites. This can take some time, but users can make it easier by choosing from one of many citation tools. Reviews can also raise (or lower) a business’ reputation, but a simple star rating and a few words aren’t enough for Google. Businesses should encourage customers to leave more detailed feedback. In-depth reviews show Google that customers are using their precious time to let others know of their experience. With enough positive reviews, a business can increase its search rankings. Research shows that 35 percent of searches have local intent. Of those using local search, 53 percent of consumers will visit a business within 48 hours of the initial search. With such a large group of local searchers, it’s important to show up on a widely-used product like Google Maps. It exposes a business to millions of people, which can attract more customers with a well-built listing that ranks high in local searches.